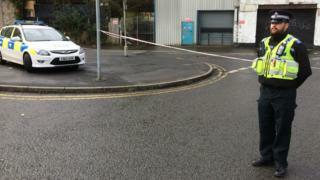 A 22-year-old man has been taken to hospital following a "serious assault" in Swansea city centre. South Wales Police has arrested a 21-year-old man in connection with the incident at Kingsway just before 03:30 GMT. Roads were closed for a time on Sunday morning to allow crime scenes officers to investigate. The man's injuries were not life-threatening, said police.